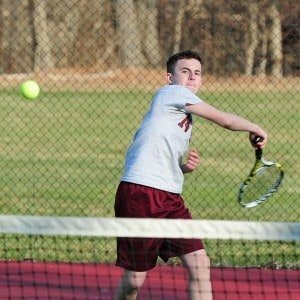 On Saturday, 4/27, the NYMA Boys Tennis Team and Ultimate Frisbee Team both loaded the bus to New Lebanon, NY to take on Darrow in league play. It was Parents’ Weekend at Darrow and turned out to be a great day for some outdoor sports. Ultimate Frisbee lost to Darrow by the score of 4-15. The team is back in action this Friday as they travel down 9W to take on rival Storm King. The Boys Tennis Team moved to 5-1 on the season by getting a big win over Darrow. Brandon Fooks led the team with a 10-6 victory in the 1st singles position. Simon Lin won 10-3 at 2nd singles while Adam Sun followed suit with an 8-5 win at 3rd. Jeffery Li lost a hard-fought match 7-9 at 4th singles. Lin and Fooks then followed up with a 6-1 victory in doubles to finish off the match. On Wednesday, 5/2, the Boys Tennis Team improved to 6-1 for the season with a dominant win over Faith Christian Academy. Mathew Montes led the team with an 8-0 victory at 1st singles. Brandon Fooks then won 8-2 at 2nd and Simon Lin added another shutout win in the 4th singles position. Robin Zhao won 8-5 at 5th and Adam Sun won 8-0 at 6th. Montes and Fooks won 6-2 at 1st doubles and Jeffery Li and Adam Sun won 6-3 in the 3rd position. Boys Tennis also had a game this Thursday against Marvelwood, but it had to be stopped due to a downpour. Cadet Montes won his match and Cadet Fooks lost a great match that went back and forth. The team is back in action Friday as they play host to Storm King in a battle of the two top teams in the league.